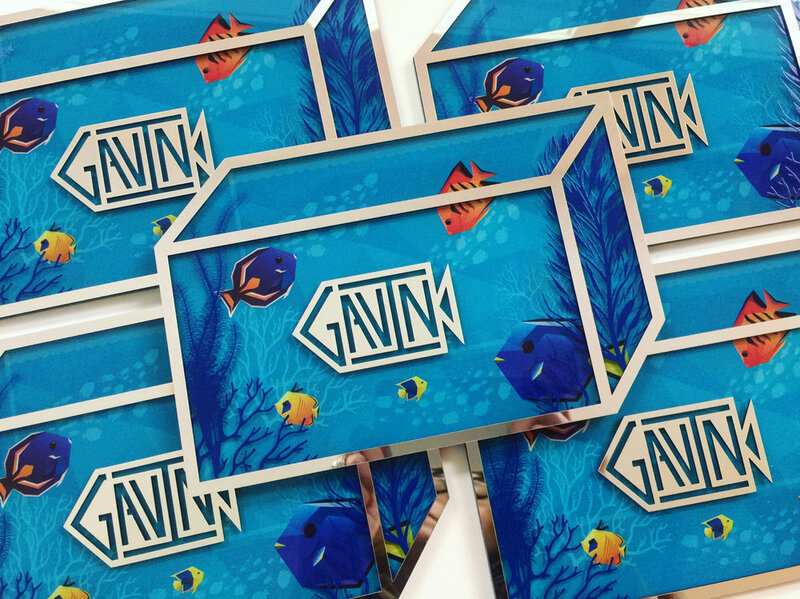 Gavin \\ Another aquatic theme! This time for one fun kid who loves sealife. We created a multi-dimensionally printed aquarium. Not sure if that's a real thing but that's what we did. Even his monogram is fishy. Declan // P R E S S P L A Y ! Hear the rap written and performed by Declan himself for his Bar Mitzvah invitation. It was a “hitzvah”! Tyler \\ That time we made a miniature basketball court out of acrylic complete with screaming fans on the sidelines and tiny foam fingers. Hannah & Julia \\ These twins went edgy. A little glass, a lot of class. Kate \\ When it all hinges on one Swarovski butterfly. And a few layers of acrylic. Kroh \\ Two parties, two invitations, two times the fun. JZ \\ Use custom artistry to memorialize your special occasions. We designed and debossed this custom leaf pattern for JZ's prayer books. 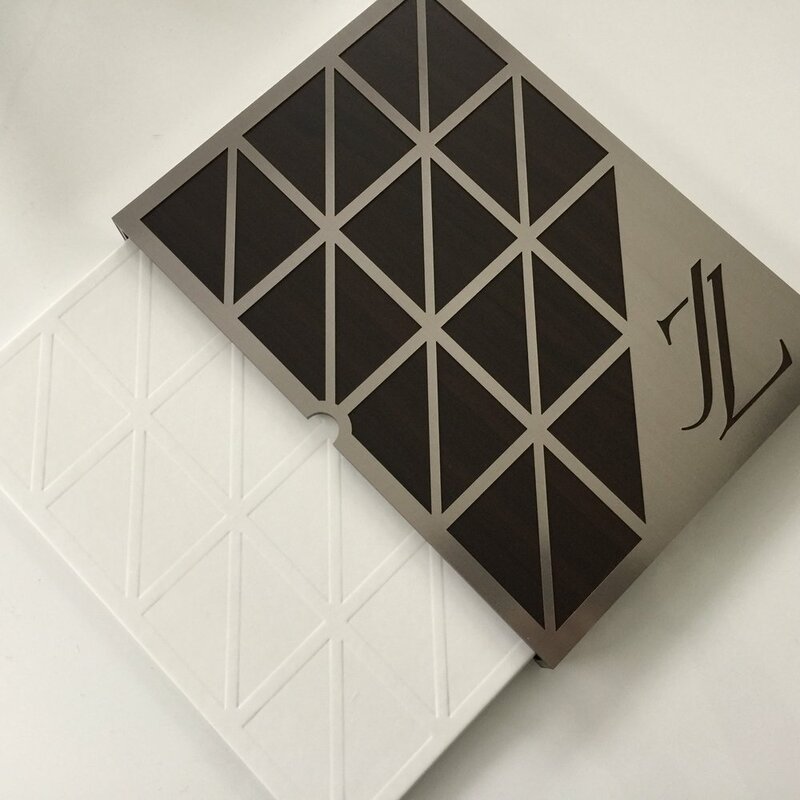 JZ \\ Inspired by one sharp young man and the architectural lines of @oneworldnyc, we designed an invitation case comprised of "Z" angles and "steel" Chroma for JZ's Bar Mitzvah. Matthew & Maxwell \\ MMMMM...this is a good one. Two boys, one letter, and a triple monogram. 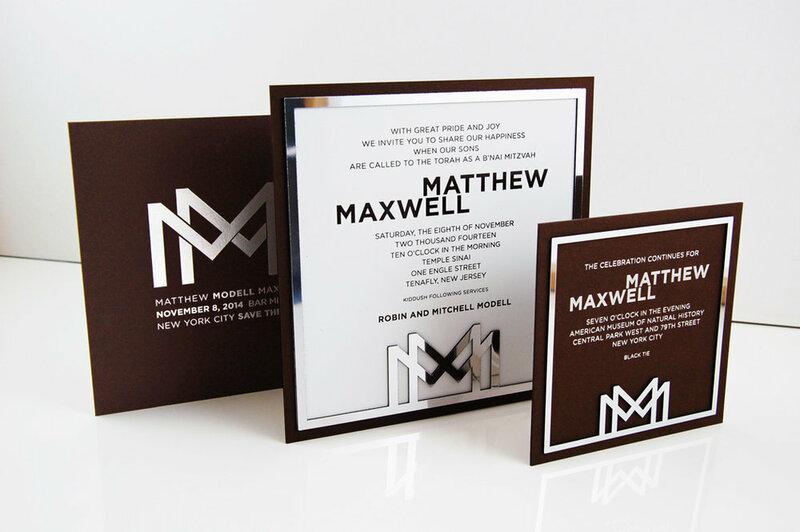 Then we designed a chrome frame around it and this bar mitzvah invitation turned into a modern, masculine masterpiece. Haley \\ When your invitation should be on newsstands because your Bat Mitzvah is so fashion-forward.A magazine complete with the amazing Bat Mitzvah girl featured on the cover as well as in the ads! Kaitlyn \\ Table dressing with these little numbers. Kaitlyn \\ Inspired by her birthstone, the ruby, we created laser cut Chroma framing to mimic the jewel and layered it over red mirror.